It is always so fun to try out a new lippies!!! Especially when they are from a new special collection from a great (and affordable) brand like Boots No 7. Boots No 7 recently teamed up with lipstick designer Poppy King for the new "Magic of Lipstick" collection. This collection was released in November to select Target stores and shopbootsusa.com. Not familiar with Boots? Boots is one of the UK's leading beauty brands! I know that when I studied in London years ago, I lived in Boots stores. So, I am thrilled that this brand is available here too! The inspiration for this collection was everyday glamour. Boots No 7 wants women to embrace luxurious lip color for day-to-day wear. Apparently, Poppy has a passion for nostalgic old Hollywood glamour. The colors in this collection and the cute polka-dot packaging was inspired by Marilyn Monroe and her famous beauty mark. 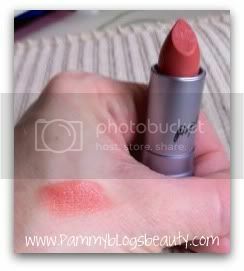 For my review, photos, and swatches, please keep reading after the page break! The collection contains seven rich and wearable shades of coordinating lipsticks and lipglosses. Liptsicks and Lipglosses retail for $9.99. Lipsticks are formulated to be long wearing. The coverage is buildable. Lipglosses are formulated more like a liquid lipstick. They provide sheer color and can be worn on their own or with coordinating lipstick. Packaging: The outer packaging is cute: peachy-orange boxes with black polka dots. Cute and elegant. The lipstick come in a small metal (aluminum?) tube and the gloss is a clear tube with a metal topped wand with polka dots. The packaging is very sleek and makes it look high end. Scent? I can not detect any noticeable scent in these products. I tested out the shade "Number Seven: Allure" in both the lipgloss and the lipstick. The shade is a lovely warm pinky-brown neutral shade. There seems to be a hint of orange/rust to it as well. (see swatches below). Sorry this picture is so blurry! I am not sure what happened! This lipstick could just possibly be my new MLBB shade for Winter!!! The wear: The formula seems to wear longer than average on my lips. The feel: This lipstick is ultra creamy going on. The feel and finish is creamy (not matte nor sparkly..just creamy). The formula is just so smooth and moisturizing. Yet, it also has great color!!! I find this shade to just be so flattering on my super pale skin. The shade is warm enough to give my face some color (but not "too warm"...more neutral). The lipgloss coordinates beautifully with the lipstick! It is the same lovely Allure shade as the lipstick, but with a high gloss finish. The color is much more sheer than the lipstick. But, this gloss is also more pigmented than your average lipgloss. Really, I would describe this more as a liquid lipstick. Moisture? This lipgloss is ultra rich and moisturizing. I feel that my lip condition is much less dry when I wear this gloss consistently. I am really impressed with the Allure Lipstick and Lipgloss that I tried from this collection. The shade is so wearable and pretty. Plus, the formulas are fabulous! My lips feel soft and good when I wear these. I have been reaching for both of these frequently and like to wear them together. I think that Poppy King and Boots No 7 succeeded with their aim for "everyday wearable" shades! Plus, the retro-inspired packaging is super cute and the price is great! Did any of you try out this collection? If not, it is worth checking out next time you are in Target!